First off, we start with a concept 'Magic Alchemist', groovy! I have not actually been using Effect Shaping any, so I do kind of want to try that. So, Effect Shaping RPM, Magic Alchemist Since this is a whole new character, and Pseudo went and found a picture that is inspirational, I go and find an inspirational picture . . . . what says RPM? Books say RPM! 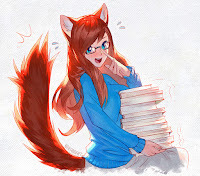 So I look for characters with lots of books! Now, I was originally thinking of maybe goofy anime hair colors and making a half elf, half elves are magic right? 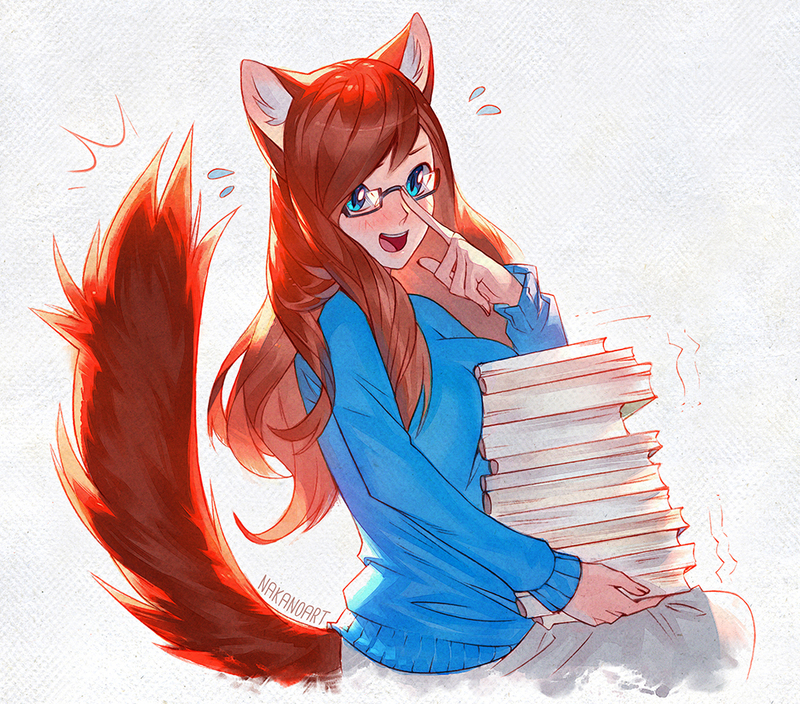 However, found a cute picture of a catgirl with a stack of books, so thinking cat. Cat . . . cats are familiars, alright, so say a former Alchemists familiar, after he Ascended or something and decided to run off and do Ascended things. Hmmm, minion who has their boss run off after Ascending? Hey, thats Pepper Potts in Iron Man! Pepper sounds like it could be a cat name,we need a proper amusing last name also that sounds catlike, so Pepper Pitterpat, Awakened Cat Familiar. I prefer starting with advantages to attributes, but there are pros and cons to both methods. When starting with attributes, it's easier to make an all-around competent character as attributes cost a lot, and dealing with other things can soak up the budget before you reach them. I prefer focusing on my "Must-haves" instead knowing even if my character isn't a rockstar out of the gate, he or she can grow into his or her britches with a couple of sessions worth of character points. That said, I think it is especially appropriate to start with attributes if the main "ability" of your character is being very strong, smart, or athletic with no especial focus. Curious is a given, she's a cat! Weirdness Magnet - Bizarre things always seems to befall Pepper, and DM's love good excuses to make the player suffer. We'll throw a couple minor racial disads in as well, Mildly lazy and Dislikes water Now, I might consider reducing Perc and Will here, but Cats are supposed to be very Perceptive, so keep Per as it is. Throw a couple levels of reduced will on it though, shes smart and perceptive,but not super willful. Also cat ears and tail are distinctive features for modern day. Disadvantages make a lot of sense to take care of early on in the process. The most easily outstanding bits of a character in my opinion are what they are very good at and what they are very good at. The list of disadvantages here has a good mix of things the player would enjoy role playing and things that can help the GM build a world around the character and give hints about what kind of challenges the player would be interested in competing with and motivations to tease. I can almost agree this before advantages makes more sense. At this point a majority of the points are already allocated, and we are going to look at skills. For better or for worse, it sounds like he runs into an issue getting all the skills onto the template that he wants. For me, skills are close to non-negotiable, so I don't like quibbling over the ones I need and only *kinda* need. Alright. We should buy skills before we run completely out of points. Her core skill is Alchemy(RPM), so we drop 20pts in that. That gives us a decently credible 25 for when she start brewing stuff, and since Alchemy (Magic) defaults to that at -4, we get 21 . . . not to bad, especially when she is using her nice nice lab. Oh gosh, we are down to 6 points left and we still can't even attack! Alright, 2 points into throwing, 2 into Fast Draw Potion, yeep! This skill list is pretty short compared to mine, but it is a lot more focused and the levels are much higher. Lets check disadvantages, hmmm, Cat-Folk from DF have Impulsiveness, I think she could be kind of Impulsive, that works, but don't think I want it super high . . . Impulsiveness (15) for -5 Lowered ST? Hmm, 8 ST could work, she is a squishy caster type! Wait, she has like 12.8 basic lift, how is she going to carry any potions? Ah ha! Gadget Potion Belt that grants Payload (Potions), as a 0% switch it's based off 2 instead of actual basic lift. We also give her Improvisational Alchemist perk from Pyramid 66, so she can improvise potions better in the field! This is not abnormal, but I personally don't like compromising stuff that I thought I wanted or needed to make things I'm finding out I need work down the line. It's a different philosophy. I prefer being able to do everything I need, even if I can't do it well. On the other hand, in my example, I had a buncha leftover points outta nowhere, so I had to go back and adjust a few things up at the end. I guess Cats should be stealthy, but well, her IQ default is better than what she would get at 1pt. Driving is in the same boat. Poisons since they are in her Talent. We give her a point in Physician since healing is good right? We have 1pt left, hmmm, Naturalist? She might like to get outside periodically right? Cats like sun. You know what we don't have? Quirks! She is a cat, and it's one of my favorite quirks, so 'Sense of Duty Kittens' And . . .
Equipment is hard for me, and I left it off my example. Seems a bit sparse to me, but something is better than nothing? Making a character, of course isn't a science, so there is no perfect way to do it. It's not even an art, if you ask me. It's more like a game. Some people find it a very frustrating game, I enjoy it. I don't know if I made it clear enough in my previous post, but part of what I wanted to demonstrate was creating a character with traceability. I created a background, and then I created a character that mostly had abilities and weaknesses that followed from there. For new players who aren't GURPS mechanical masters, I prefer they write me a background so I can build them a suitable character sheet from that detail. The background is meant to show what information is useful to me as a GM; a weirdly nebulous concept I've struggled with in previous posts. The things a good character background (in my opinion) need for GURPS are different than, for example, a good character background for a novel or other work of "passive" entertainment. I can't quite put my finger on it, but I think for an RPG, one needs to set up a character to be going into an adventure, and in a book or movie, the character is already there and doing it... but words fail me!